This one has a whole lot of lol wut? to it. I guess five Jesuses is no big deal. Composite icons like the third one in Dominika's post are quite common in Russian tradition. Your post is unbecoming and irreverent. NT Trinities, Ancients of Days, and three dozen or so other types of icons you regularly denounce are also quite common in various Eastern Orthodox traditions. Will you seriously argue that you do so in becoming and reverent ways? Yes, you will, and all I've done is imitated you in fewer words. Your imitation is a failure. Other than the presence of God the Father as an old man in the composite icon Dominika posted, there is nothing wrong at all with it. OTOH, the denunciation of uncanonical imagery is necessary, if not an obligation, in the face of the continued perpetuation of such images, including by "master iconographers" who oughta know better. I belong to a canonical Orthodox jurisdiction. My bishop approves of what I write and say on iconography. That is all you need to know. No, that is not what I need to know. Who's your bishop, LBK? Whom can I contact to verify that what you say about yourself is true? No-one on the forum, not even a moderator, can force any member to divulge personal details against their wishes which may identify their identity, place of residence, etc. There have been cases on the forum where such details have been divulged without permission, resulting in members being warned, put on post moderation, or, in one recent case, banned. Like a lot of your pseudotheology. Please provide examples of my errors, from the liturgical, patristic, conciliar and scriptural tradition of the EO Church. Why? Any time I've challenged you in the past, you've either ignored it and repeated yourself or disappeared until things died down enough to make it safe to resurface. It's old. IOW, you and PtA simply griping, offering nothing of substance. Not the first time. And yet you will hide behind your anonymity whenever someone calls your self-proclaimed authority into question. You have no authority to dogmatize your view of icons except for that which you claim for yourself, and as long as you continue to hide behind your online anonymity, you will have no more authority than what you claim for yourself. I've not made any great effort to hide my affiliation and place of residence. I'm sure, then, that anyone who does at least a cursory search of my posts will know that I live in Oregon, USA, and that Archbishop Benjamin of the OCA Diocese of the West is my bishop. I'm not even trying to claim any authority for myself beyond that which has been given me. Nobody's forcing you to divulge this information about yourself, but it is quite telling how ardently you defend your secrecy and the secrecy of your sources while at the same time proclaiming yourself an expert on all things iconographic. And there have also been cases where persons were instructed by the moderators to cite their sources with refusal to comply resulting in similar penalties. Maybe others here will defer to your "expert" authority on icons because what you say looks reasonable on the surface, but your steadfast refusal to name your sources does nothing to persuade those who question your "authority" to define the canonical reasons why some icons are unacceptable. To us you're just another nameless person on the Internet who loves to pontificate on a few pet subjects and bludgeon others into submission by the forcefulness of your rhetoric. And there have also been cases where persons voluntarily divulged information at least about their sources so as to establish their authority on a subject. Maybe others here will defer to your "expert" authority on icons because what you say looks reasonable on the surface, but your steadfast refusal to name your sources does nothing to persuade those who question your "authority" to define the canonical reasons why some icons are unacceptable. 1.What personal information you choose to divulge on this forum is your concern. I have chosen otherwise, as is my right and privilege, and you cannot force me to do so. 2. A great many of my posts on iconography over the years indeed quote sources from the patristic, conciliar, historical and especially liturgical traditions of the Church, yet even these are accused as "merely my interpretation" by you and others, for reasons best known to yourselves. 3. It is only fair that every forum member, including you, be compelled to provide a full bibliography for the posts they make on doctrinal and theological matters, if you expect my posts to come under such high scrutiny. Because you never cite authorities outside yourself even for the novel interpretations of the patristic, conciliar, historical and liturgical traditions that you put forward. Lex orandi, lex credendi means we pray what we believe, and we believe what we pray. Simple, really. Why should we believe anything the Church teaches, Peter? Because archeology backs it up? Because this noted authority or that actor who plays one on TV says so? Why believe in a crucified God? Why believe in a virgin conceiving and giving birth, and to God Himself? Why believe that bread and wine become the Body and Blood of the Christ? There are plenty of good excuses not to, it hasn't been scientifically reproduced in a laboratory, the archeological evidence is sketchy at best, and there are no shortage of "other" explanations for just about everything. If it were possible for God to become incarnate, to be conceived and born as a human Child from a virgin "who knew not a man", while still maintaining full divinity and omniscience, to suffer, die, rise from the dead, and ascend into heaven, why is it so impossible that the girl God chose to bear His Son in the flesh could enter the Holy of Holies? Is the will and power of God subordinate to the mores and customs of the Levitical priesthood? Let's also not forget that when the 40-day-old Christ was presented to the Temple, Orthodox tradition, both in hymnography and iconography, shows the Child's mother presenting Him, not St Joseph, contrary to the Jewish custom of the father presenting the child. It is also significant that, in St Luke's Gospel, Symeon addresses the Mother of God, not Joseph, saying to her: “Behold, this Child is destined for the fall and rising of many in Israel, and for a sign which will be spoken against (yes, a sword will pierce through your own soul also), that the thoughts of many hearts may be revealed.” Does this mean you also dispute the hymnographic and iconographic depiction of the Virgin presenting her Son to the Temple, as it is contrary to Jewish practice of the time? We believe that the Orthodox Church faithfully preserves the Apostolic witness to the revealed God, or we don't. Not the conjectured god, not the reasoned god (or even "reasonable" god), not the god of guesswork, but God as revealed in Christ Jesus. If we don't believe this or cannot accept this, then we are, eventually, going to have to deal with the idea that we might be in the wrong place. At some point, you either come to terms and accept what the Church teaches, or you don't, because we believe that the Church teaches what Christ revealed. We are not Gnostics, we don't believe that the "real" truth is hidden from the rabble and only known by the elite, an "inner circle", a church within the Church who do not have to believe as the others do, because they "know better". Many a saint and Father says humility is the highest virtue. Which is more humble, Peter? "I know better"? Or "I accept the teachings of the Church"? I can't see where anyone can go wrong by listening to, and absorbing, the hymnography of the Church. The truth is in our hymns and prayers. As long as you let it change your life, you will find salvation. I have presented the testimony of the Church on this matter through her prayers. These hymns and prayers are ancient, and are from a feast of the highest rank of importance the Church ascribes, a rank exceeded only by Pascha. For you to suggest we don't have to believe the Virgin actually dwelt in the Holy of Holies is extremely problematic, particularly in the face of St. Paul's admonition that we should strive to be "of one mind". The clear proclamation of the Virgin entering the Holy of Holies in hymnography (which, like iconography, represent the consensus patrum of the Church) elevates this event above the realm of theologoumena (theological opinions), and into the realm of doctrine. Thank God we do have the hymnody and prayers of the Church. They helped preserve the Church through oppression and persecution, and will also preserve us from intellectual/rationalistic oppression. I don't know. Maybe it's my modern sensibilities or something but I find it really bizarre and untoward to speculate on the state of the Theotokos' hymen. It's odd to me. People who insist on hueing to the Protoevangelium started it. Most people reading the Bible or listening to the Liturgy on this would assume that Jesus was not in fact teleported out of her womb in a cloud of light. As the fire rested on the bush and the bush was not burnt, so God descended and rested on the Virgin. He was pleased to take flesh from her and he did not break the seal of her virginity. "What have I to do with you, O Jews?" Mary answered and said. "I am kept sealed and I am no adulteress. My Lord was pleased with me and I became his mother, and he sucked milk like an infant." May all generations among all peoples call Mary blessed, who was worthy to become Mother to the Son of God. He came forth from her while the seals of her virginity were kept unbroken. Behold, the day of her remembrance is honoured in heaven and on earth. Like a flawless pearl, set in the crown of the king, is the Holy Virgin Theotokos: it is turned to all sides and its brightness shines like the sun. Behold, the day of her remembrance is honoured in heaven and on earth. Glory to the Son of God, who was pleased to come forth from the Blessed Holy Virgin. By her ear she received him and she bore him in her womb. He came forth from her womb and it remained sealed, confounding the unbelievers. Glory to him who so humbled himself, glory to him who became a son of man, glory to him who saved his Church and, behold, she sings praise. The just of old gave fair and lovely names to Mary, the Daughter of David, the Holy Virgin: Ezekiel the exile called her the Closed Door, Solomon (called her) the Garden Enclosed and the Sealed Fountain, David named her a City and Christ the Blade which shot up within it without seed. He has become the Food of the nations and he has exalted her memory in heaven and on earth. Glory to him who rested in the womb and dwelt there as he willed in his mercy. Glory to him who came forth from the womb and its virginal condition was not corrupted. Glory to him and to him who sent him, (glory to him) who humbled himself for our salvation and became man of his own will, that he might make us sons of his Father and partakers of his Holy Spirit. Blessed are you, Mary, who gave birth to the living Son of God. Blessed are you, Precious Vessel, in whom the Merchant descended and dwelt. Blessed are you, Palace of Perfection, who received the Architect of the heights. You bore him and your virginity was preserved, you brought him forth and remained pure. Blessed is the Lord who came forth from you. O Solomon, fair child, what is that garden of which you sang, which was closed and sealed in its virginity? "It is Mary from whom came forth the Gardener who planted Paradise." Will you take Mor Ephrem to task over this as you are with me? I cannot be compelled to divulge personal details of my own on the open forum, or of others who have not given their permission for me to do so. Moreover, the "proofs" sought in that sea of green would include several decades' worth of homilies and other pastoral teachings on the feast of the Entry into the Temple (and other feasts) I have been witness to in my time in the Church, including by priests now deceased. I regret that I do not have audio recordings or transcripts of them. It is a great pity that your animosity towards what I post has yet again led you to act this way. How is naming your bishop revealing any personal information? My bishop is Bishop Thomas, but that doesn't tell anyone any information about me other than I live in the Mid-Atlantic region of the US. Because not everyone wants to tell where they live. I guess so, but she has already told us she lives comment removed --Mina, so it isn't like it is a mystery where she lives. Unless you can show exactly where LBK said this, I am obliged to remove this comment based on previous history of requesting this information may not be divulged. Why should he? 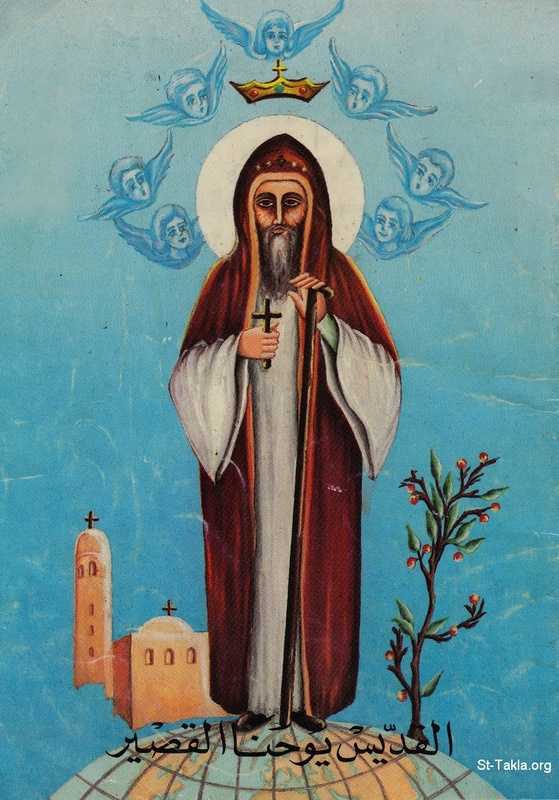 Mor Ephrem doesn't make up his theology. Repeating an allegation doesn't make it true. Especially when you've provided no evidence supporting it. I have quoted hymnography to support the Church's teachings in many a post, yet have been criticized for doing so. Mor Ephrem quotes hymns on recent threads to support certain teachings, without a murmur. The double standard is clear. I am more interested about the above. I think LKB's opinions are authoritative and are worth learning about/considering. I am not in a position to state that she is an authority (but it wouldn't surprise me). I do not think the bickering that is going on is useful. I am not in a position to state that she is an authority (but it wouldn't surprise me). You wouldn't be surprised she is a bishop? 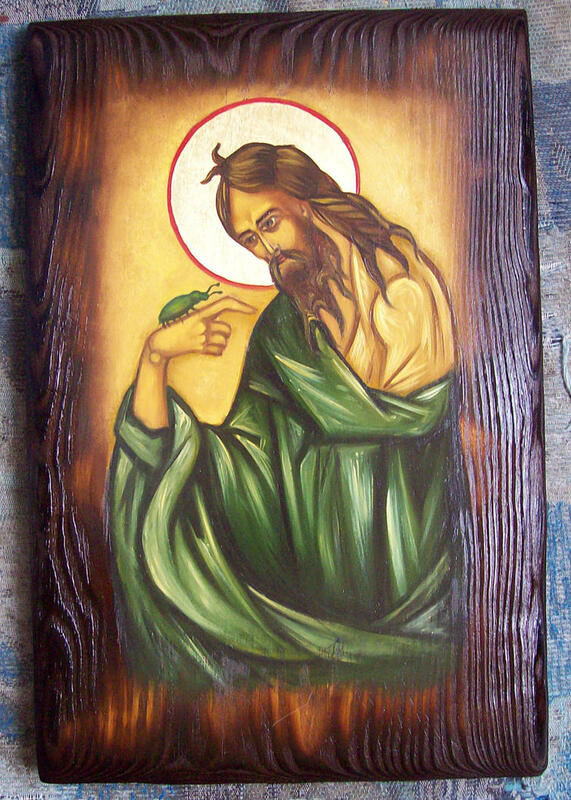 Is that supposed to be Jesus making a bug friend or John the Baptist about to have dinner? You have to admit, that bug is adorable. I'm more troubled by John the Baptist's man-bun or whatever he's got going on. I've read this three times now and each time I laughed. You can eat bugs during Lent. They're invertebrates just like clams, shrimp, and crabs. You can eat invertebrates. I think I ate an ant today. They're invertebrates just like clams, shrimp, and crabs. You can eat invertebrates. Is apple cobbler an invertebrate? Apple cobbler is a fruit. And if the apples in the cobbler have maggots, you can eat them, too. Thanks, I'll just... uh... No.